If you take a look around, you will see stunning architecture everywhere. Whether it be a huge home set in the country or a skyscraper in the city, many buildings are awe-inspiring. However, nothing is cooler than a well-designed treehouse. We have gathered photos of the most amazing treehouses from around the world. Yellow Treehouse Restaurant towers high within a redwood forest in New Zealand. It has an organic design that integrates beautifully with its surroundings. It sits 40 meters high around an enormous redwood tree. It looks like a giant chrysalis in the middle of the woods. At nighttime, when it is lit up, it looks totally surreal. 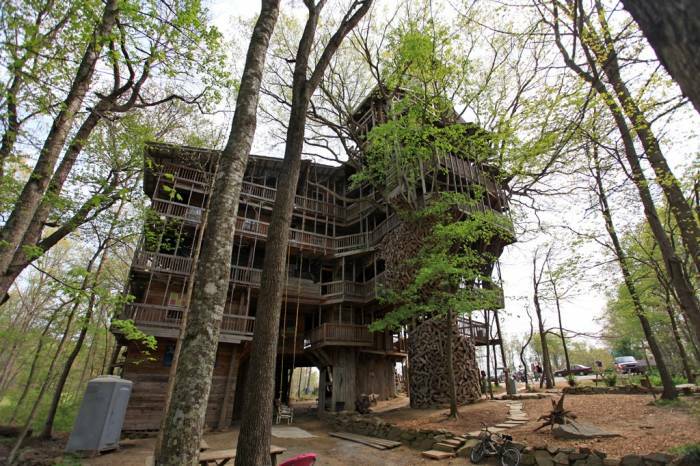 Horace Burgess bought a piece of land in Crossville, Tennessee, spotted a large tree and decided to build the world's biggest treehouse back in the 1990s. According to roadsideamerica.com, Horace ran out of wood, so he had to stop building. "Then I turned my life over to God," Horace recalled. "And the spirit of God said, 'If you build Me a tree house, I'll never let you run out of material.'" Horace decided to get ordained as a minister and went back to working on his treehouse. It took 11 years, but he got the job done. It might not be the biggest tree house in the world, but it is really impressive. The house spans seven trees and is 100 feet tall. It is truly a sight to see. According to treehousemap.com, this is one of the highest treehouses in the world. Often referred to as the "plexiglass portal on the world", it sits on top of a tree at the Beach Rock resort in Okinawa, Japan. What makes this treehouse so interesting is that it was built in order to be used to communicate with aliens. This incredibly cool treehouse resort is in Vancouver Island, British Columbia, Canada. The spheres can only be reached by using stairs and suspension bridges. These suspended orbs are one of a kind. It is no wonder that they are on many people's bucket lists. The Nothofagus Hotel can be found among the treetops of the Huilo Huilo Biological Reserve in Chilean Patagonia. It is a truly magical experience to stay in the middle of the rainforest at this luxury hotel. You can treat yourself to the food and culture of the area while staying in one of the most unique lodges in the world. This treehouse built for two can be found in Dordogne, France and costs around £200 per night. This magical little castle among the trees is situated where the moat of the old French château, Monbazillac used to be. The owner of this chateau is known for his treehouses that he has built all over France. This little getaway is surrounded by trees and gorgeous countryside. It would make for an amazing stay. According to soneva.com, "The free-spirited nature of childhood was our inspiration for the Treepod. That desire to climb high up into a leafy canopy and find shelter amidst a simple wooden construction where imagination soared and dreams were born." This spot allows the visitor to climb inside a bamboo pod among the trees for a truly unique dining experience. How could you not love being served by your own personal waiter via zip line? How cool is that?! The landscaping surrounding these pods is truly breathtaking as well. These houses are available to rent in the South China Sea. There are four in total built among the tamarind trees. They are fairly isolated and close to a beautiful beach. Some of the sites are only accessible through the use of suspension bridges. The houses vary in size and capacity. Some can house only sleep two people comfortably, others six, while one can sleep up to twenty people as it has seven sleeping spaces spread across three levels. It truly sounds like a dream vacation spot for the whole family. Finca Bellavista is a treehouse community in Costa Rica. This is a private area within the rainforest preserve that offers a unique experience to travelers. You are surrounded by the beauty and adventure that awaits right outside your door every day. It would make for a great spot to visit either on your own or with some friends or family especially if you are wanting to get back to nature. The views from all parts of this area are simply amazing. The Hapuku Lodge is located in Kaikoura, New Zealand. These tree houses make up one contemporary hotel build on a deer breeding farm. According to the lodge's website, "It sits snugly at the base of the Kaikoura Seaward Mountain Range, with the Kaikoura coast and famed Mangamaunu Bay only a kilometer to the east." Each house is ten meters or higher than the canopy of a Kanuka grove. There is so much nature to be enjoyed from staying here. It really seems like a fantastic spot to relax for a few days.